Tiger Muay Thai and MMA Phuket team sponsored fighter Dorian Price will be stepping back into the Octagon with an upcoming MMA fight against UFC hopeful Ryan Bigler at the Pacific Xtreme Fighting Championship event in the Manila Philippines Feb. 18th. Dorian Price, an Ultimate Fighter alumni and a UFC Veteran, will be returning to the cage for the first time since his 2007 UFC loss. 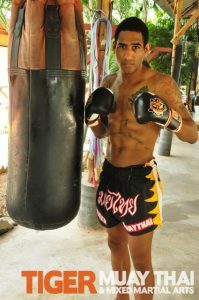 Rededicating his career to Muay Thai, the Brazilian Jiu Jitsu Purple Belt was recently ranked the #5 Light Heavyweight in North American competing in Muay Thai. Look for D, to continue working his takedown defense with Coach Ambrose, while developing his grappling with Professor Elbe during his upcoming training camp.